PHOTO CAPTIONS: 1. 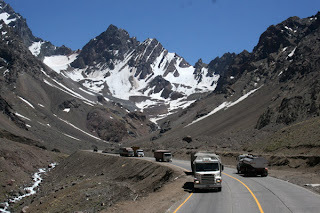 Crossing the Andes, 2. Andre's first sight of snow, 3. 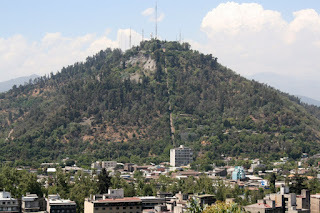 The virgin on top of Cerro San Cristobal is dwarfed by cell phone towers, 4. Andre and the Virgin, 5. The view from Cerro San Cristobal, 6. 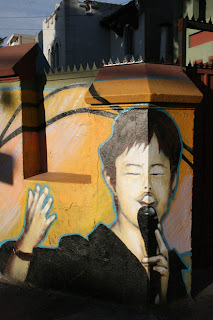 Maya's photo among the prayers, 7. The cross and the pope inside the Virgin statue, 8. & 9. Making friends, 10. 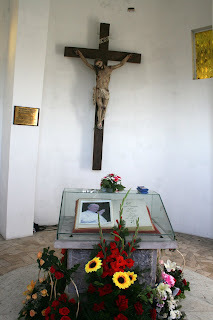 Cerro Santa Lucia, 11. The fountain at Sta. Lucia, 12. Andre enjoying the view, 13.-18. 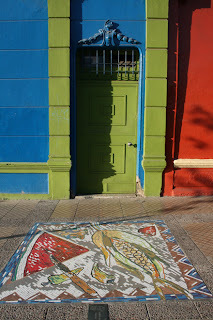 Street scenes in the bohemian Bellavista neighborhood where we stayed. 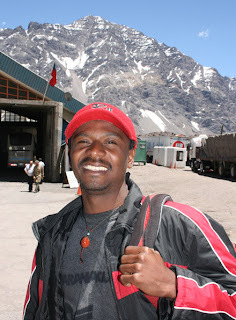 The 6-hour bus ride over the Andes from Mendoza, Argentina to Santiago, Chile was quite spectacular. I kept hopping from one side of the bus to the other, taking photos and videos of snow-capped peaks, cascading falls of melting ice, and commercial trucks crawling back and forth on the switchbacks. We passed several ski resorts, all shut down for summer. I was sad to see the train tracks along the way, mostly abandoned except for a stretch on the Chilean side where cargo trains still carry minerals out of the mines. In case you didn’t know, I’m a train nut and used to hop freights. 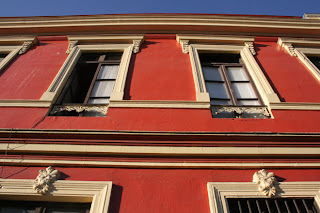 We arrived late afternoon in Santiago without much of a plan for housing. Usually there’s a tourist information booth in every bus station with free maps, where they’ll call ahead to make hotel reservations. Not the case in Santiago. 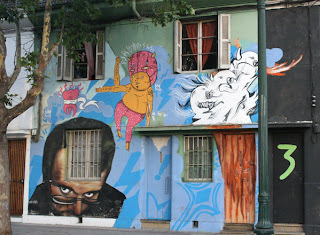 We got on the metro and asked around what might be a good neighborhood, ending up in the trendy bohemian area called Bellavista. It’s actually fun and funky, unless you had any intention of sleeping at night. We’ve stayed three nights in three different hostels and last night was the worst. We fell asleep to drumming, blasting music, cars honking, people yelling, then woke up at 4:30 a.m. and couldn’t get back to sleep for an hour or more while the party raged below our window. And it’s not cheap. That’s bad news for a tightwad like me. In Argentina we were paying $23 for a private room with our own bath in a charming, albeit slightly rundown, hotel. Here we paid $40 for a double room with shared bath downstairs. They only had space for one night, so we got moved to their sister hostel where we got a much smaller room with a farther bath for $36. Again, it was only available for one night, so we switched to a hotel right on the main street with private bath for $49. Other than the noise, it’s not bad. I can even get online if I hang my laptop out the window a bit. We had two goals for Santiago. 1. Find the birthmother of a friend’s daughter. 2. Find the racquetball courts. After 3 days in this expensive big city, we haven’t accomplished either goal. 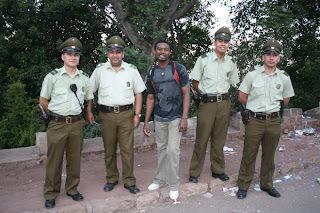 In fact, we had to add another one –a Bolivian visa for me. 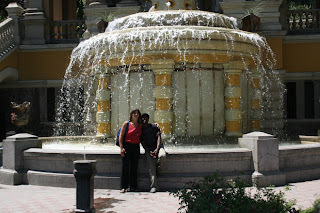 I just found out from Jean, my Santa Cruz friend who we hung out with in Buenos Aires, that as of Dec. 1 Americans need $100 visas to visit Bolivia. When did they come up with that idea? We just got Andre’s Bolivian visa in Montevideo a couple of weeks ago and the consulate said nothing about me needing one. They must be in cahoots with Brazil who just started charging Americans $100 for tourist visas in retaliation for expensive US visas. Just because everyone hates Bush and US immigration policies, why am I being punished? 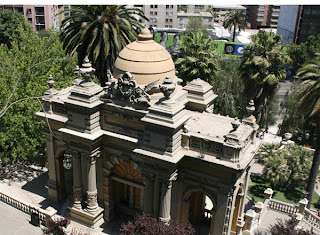 Actually, Santiago is a pretty nice city. It’s been easy to get around because of their great metro system and the impressive phone directory, which has pages of city maps with indexes. The yellow pages even give you the page number and guides to find locations easily. So far, we hit two dead ends on the search for the birthmother. The house where she worked as a domestic was empty and no one in the neighborhood remembered anyone named Mercedes who worked there 17 years ago. Today, we tracked down the apartment where a foster mother supposedly lived, but no one in the building, even people who’d been there more than 20 years recalled someone named Blanca who took care of a baby. The adoption lawyer’s phone number is disconnected and he’s not listed or online. Tomorrow is one of our last chances. 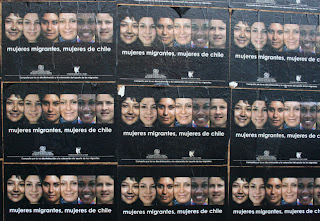 We’ll go to the Registro Civil to look up the birthmother with her full name, national ID#, and birth date. 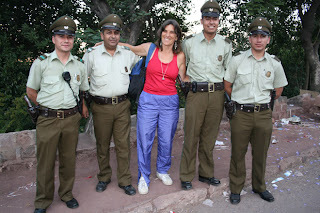 Chileans assure us that we’ll find her, but my cousin who lives in southern Chile isn’t so sure. I keep emailing the two contacts for Chilean racquetball, but haven’t heard back. I found an address of a racquetball club online, but haven’t had a chance to track it down. Time is running short because we have a 26-hour bus ride to the border of Bolivia, and I’d like to visit Potosi and Sucre before going to Cochabamba for the World Juniors Racquetball Championships from Dec. 14-20. 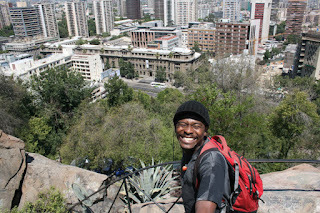 Even without racquetball we’ve been getting exercise here in Santiago -- climbing hills. Yesterday we took the funicular (trolley) up to the Cerro San Cristobal and walked down, which took more than an hour because the road winds around the hill. 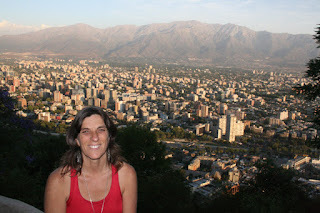 Today we climbed the smaller Cerro Santa Lucia for another panoramic view of the city. 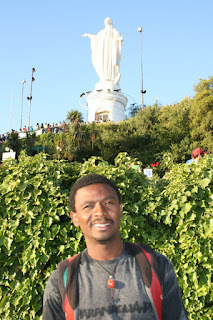 San Cristobal is more popular, with its virgin statue and chapel. I admired the very elderly, some with crutches and canes, climbing one step at a time. 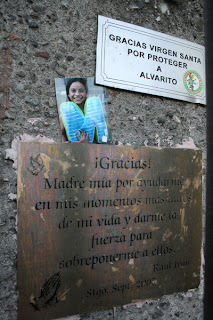 I lit a candle for Maya and left her photo next to other photos and prayers on a brick wall near the candles. My emotions got the best of me, even though I’m not Catholic. I kept hearing over and over in my head: Llegué demasiado tarde – I arrived too late.